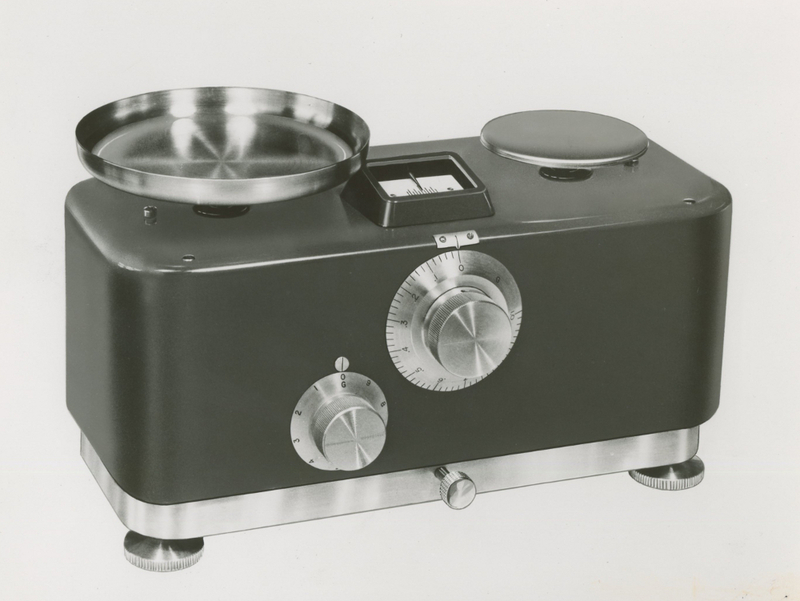 Weighing of waxes, esters and ethoxylated products is now accomplished in 20 per cent less time that previously in the production control laboratory at the Williamsport, Pa., plant of Glyco Chemicals, using the two-dial weight-loading DWL-3 balance manufactured by The Torsion Balance Company of Clifton, N.J.
Operating on the unique torsion principle, the DWL-3, unlike conventional balances, has no knife edges bearings to become dull or worn and impair accuracy. Instead, it has torsion bands that eliminate friction and wear. Of a special corrosion-resistand alloy, the bands possess outstanding strength and fatigue resistance. After one million continuous test cycles the durable torion mechnism retained its original accuracy. An average of 380 weighings per day are now made, according to Forrest W. Standley, Jr., Glyco’s chief control chemist at Williamsport, compared with only 300 previously on undamped graduated-beam balances. An oil dash pot damps oscillations and brings the Torsion DWL-3 balance to rest immediately for faster weighing. Time is no longer lost in centering weights, Stadley reports. Elimination of airborne contamination setting on riders beams, he adds, has resulted on unimpaired accuracy and greatly decreased maintenance. A pair of dials on the front of the DWL-3 balance assures speed and convenience in weiging. Manipulation of small weighits below 10 grams is eliminated by dial-in loaders on the balance. Besided saving time, this prevents loss of accuracy from rough handling of the weights. Together, the weight loading dial and the fine weighing dial can load up to 10 grams on the balance, and give a weighing readable to four milligrams. Weight loading can be dialed in by one-gram increments. The fine weighing dial has 20-milligram graduations up to one gram. Both dials can be operated without arresting the balance. Samples up to 15 grams of materials in process are weighed by Glyco Chemicals to an accuracy of 0.01 gram. The DWL-3 balance has a capacity of 200 grams. In weighing samples for control analysis, the product is introduced into a 10-ml. Pyrex beaked and the filled beaker is weighed. Then the product is emptied into an analysis container, and the empty beaker is weighed. The difference between the weight of the filled and unfilled beaker gives the product’s weight. Torsion’s DWL-3 balance is designed to facilitate the weighing of larger quantities. Since it is free from friction and wear, the DWL-3 is not affected by dust or airbone chemicals. It has pans of polished stainless steel to withstand corrosive attact by chemicals. The commoditypan is 5” in diameter. The DWL-3 is equipped with non-binding leveling screws with easily adjusted knurled flangers. It is completely enclosed in its metal case, and has over-all dimensions of 11-3/4”x6”x6-3/4”.